Background: Nowadays, laparoscopic surgery has feasibility of partial liver resection and pancreatectomy because of less invasion than a conventional open operation. It is known increased intra-abdominal pressure on the liver and on the pancreas induce reduction of micro- and macro-circulation and this cause severe damage on splanchnic organs. However there is not enough monitoring method to evaluate metabolic changes during and after pneumoperitoneum. Microdialysis is a technique to monitor the matebolic state of organ itself, based on a chemistry analysis over time with sampling of interstitial fluid using membrane based dialysis sacs. In physiological conditions during glycolysis, glucose is metabolized into pyruvate. During ischemia lactate is produced from pyruvate in order to maintain anaerobic glycolysis with low energy production. Glycerol is an end product of lipolysis in adipose tissue and is also an indicator of membrane disintegration during such events as ischemia. All these parameters of ischemia can be monitored in the tissue with microdialysis. The aim of this study was to evaluate cell damage during and after pneumoperitoneum on the liver and the pancreas with microdialysis. Material and Method: Microdialysis catheters were inserted into the liver superficial and deep in the liver parenchyma, as well as into the pancreas of 4 pigs after laparotomy. 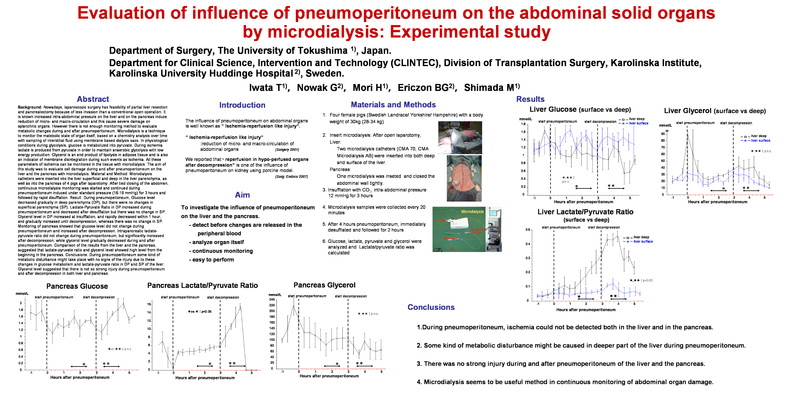 After tied closing of the abdomen, continuous microdialysis monitoring was started and continued during pneumoperitoneum induced under standard pressure (16-18 mmHg) for 3 hours and followed by rapid disufflation. Result: During pneumopeitoneum, Glucose level decreased in deep parenchyma (DP), but there were no changes in superficial parenchyma (SP). Lactate-Pyruvate Ratio during pneumoperitoneum in DP and decreased after desufflation with no changes in SP. Glycerol level increased both in DP and SP at insufflation, and gradually increased until decompression. Monitoring of pancreas showed that glucose level did not change during pneumoperitoneum and increased after decompression. Intrapancreatic lactate-pyruvate ratio did not change during pneumoperitoneum, but significantly increased after decompression; while glycerol level gradually decreased during and after pneumoperitoneum. Comparison of the results from the liver and the pancreas, showed that lactate-pyruvate ratio and glycerol level were from the beginning higher in the pancreas. Conclusions: During pneumoperitoneum some kind of metabolic disturbance might take place with no signs of the injury due to these changes in glucose metabolism and lactate-pyruvate ratio in DP and SP of the liver. The pancreas is more sensitive against increasing intra-abdominal pressure than the liver. Glycerol level suggested that there is not so strong injury during pneumoperitoneum and after decompression.